Man City boss Pep Guardiola has conceded that midfield stalwart Fernandinho could be a doubt to face Tottenham on Wednesday night. Spurs hold a 1-0 advantage after the first leg of the Champions League quarter-final tie earlier this week, with the two Premier League giants meeting again at the Etihad in a few days time. 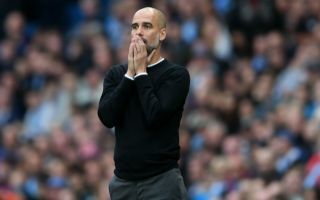 However, after being left out of the squad to face Crystal Palace on Sunday, Guardiola was asked about Fernandinho before the game on Sky Sports. While he suggested it’s a short-term injury problem, he didn’t sound overly optimistic about the chances of seeing the Brazilian ace return in midweek, as noted in the tweet below. Fernandinho, 33, has been a pivotal figure for Man City again this season, making 39 appearances across all competitions already as a mainstay in Guardiola’s line-up. With the Premier League title and their Champions League aspirations on the line, the last thing that the Spanish tactician needs is to be without his midfield general, with his absence against Palace a blow in itself as City look to go back top of the table, temporarily at least. As the key anchor in their midfield, losing him for the visit of Tottenham will be a blow, and so it would appear as though Guardiola and City have an anxious wait on their hands to determine whether or not their midfield lynchpin can return in time. Having said that though, with the likes of Kevin de Bruyne and Ilkay Gundogan at his disposal, Guardiola certainly has quality depth available if he does miss out.